I am certainly happiest when I am able to freely make art. And it is especially rewarding when this can be overlapped with the gleeful appreciation of my work by discerning viewers. When someone asks me to make a piece just for them, there’s that special feeling of warmth and eagerness that ensues. Whether that be weaving a rag rug with colors to match their sofa or stitching the costumes that will make a Shakespearean play come to life. It takes a unique type of art appreciator, though, to spontaneously request the production of a large textile just for them. But such was Carole’s reaction to seeing the smaller works on display at my gallery presence at Farmstead Creamery. A pictorial Navajo-style tapestry with songbirds at the feeder caught her eye, and she promised to go home and measure her space. A few months later, she was eagerly sending images of her living room and sofa, with its mounted aging textile she was interested in replacing. The directions were straightforward yet restrained: 40 x 35 inches, hummingbirds, and I trust your artistic style. I put together my quotes–3 to 4 months for a punch needle tapestry, 3 to 4 years for a woven tapestry of the same size. “At my age,” she laughed, “I’m not sure I should wait four years!” So punch needle it was. Throughout the design and planning phase, Carole’s enthusiasm has been infectious and fun. I wanted to create a textile that not only captured that vivaciousness and her love of hummingbirds but also bring the colors of summer into her room. Alas that all our flocks of buzzing hummingbirds had long since left the farm! 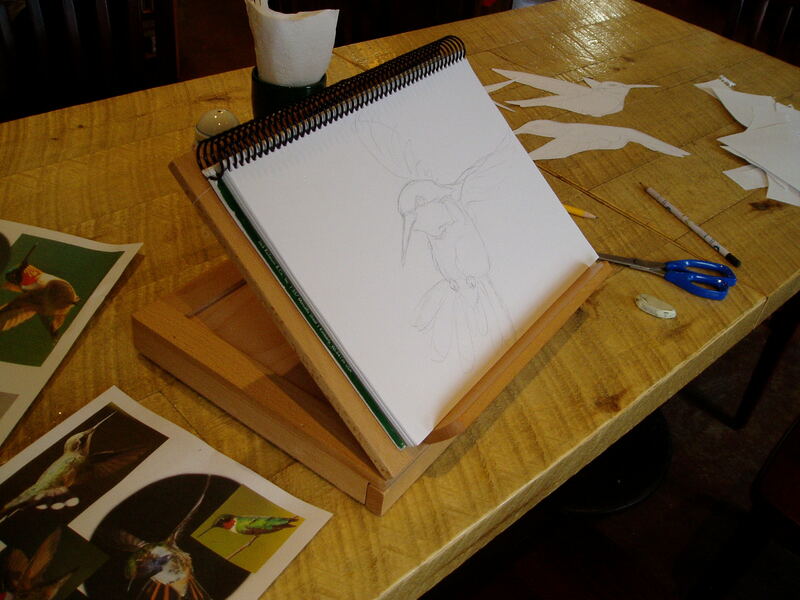 Time to search for quality photographs of these amazing animals as my “models.” I began by sketching the hummingbirds individually, in nine distinct poses. 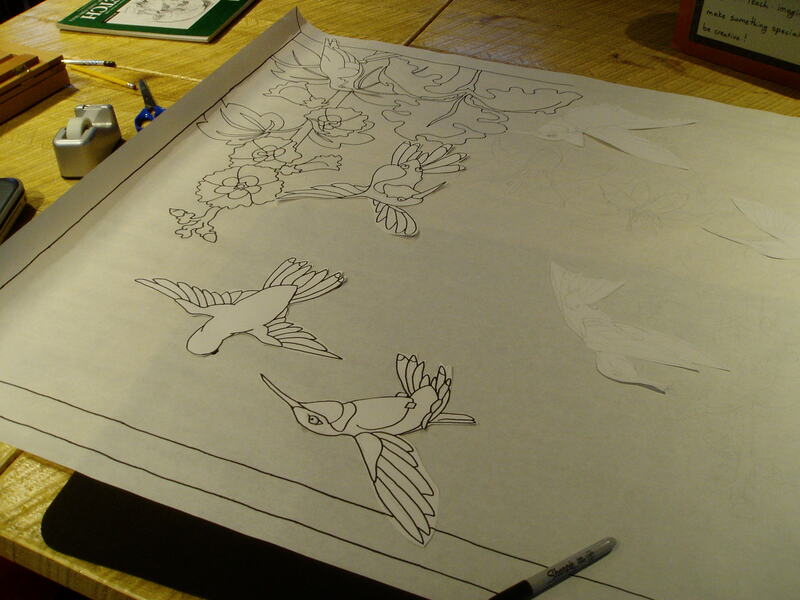 I then cut these out to make bird models that could be moved around within the frame of the piece. Being nearly square, it made creating a satisfying composition trickier than if the piece had been either taller or wider. For the background, Carole had voted for flowers instead of feeders, so I drew from the blooms in our butterfly garden that pleased our own hummingbirds the most: hollyhocks, iris, and tiger lily. These also offered their own delicious color palates to interplay with the greens, whites, reds, and grays of the birds. With the blooms sketched, I then shifted the birds around on the scene, trying one here and there, making small vignettes of mated pairs dancing or juveniles catching a sip of nectar. A few of the bird poses were nixed right away as too adversarial for the idyllic scene. Lightly taping seven to the paper, I then tacked up the arrangement on the wall, and the whole family team had a chance to think on the design and help tweak a few positions–removing one last bird that just didn’t seem to “fit” the scene. And then, at last, it was like the composition “clicked,” and it was time to take a photo to send to Carole for cartoon approval. She was delighted! No edits. She even shared the image with her sister, who also complimented the arrangement. This may not happen for a commissioned work again, so it was cause for celebration. With the down payment secured and the cartoon approved, it was time to move forward with the production of “Hummingbird Haven.” The first order of business, of course, was to order the monk’s cloth backing and begin assembling colors. “Let us know how it goes!” Heidi of the Oxford Company encouraged. “I love the drawing and can’t wait to see how it turns out.” She took my cutting order, and the backing was shipped off the next morning. Amy Oxford was also excited, offering advice on ways to keep the large amount of background interesting visually and texturally. Originally, Carole had wanted the background in beige but then changed her mind. There is plenty of beige in her home already, and some added color would bring more life to the space. Mimicking the soft blues of the accent pillows, I pulled a variety of indigo wool Kara and I had hand dyed together as a wintry day project. Alongside this on the big table were oranges and golds for the tiger lilies, blues and violets for the iris, and pinks and deep reds for the hollyhocks. Brighter reds were set aside for the throats of the male hummingbirds, along with a great variety of greens, including some with sparkle threads mixed in with the yarn. I’ll have to try some test runs of these to make certain they will feed through the punch needle, but they would add that shiny luster that would help the birds “pop” from the middle- and background of the composition. Since the design was approved in the form above, I transferred the drawing through to the back side of the cartoon before transferring it onto the monk’s cloth (using our bakery case as my light table). 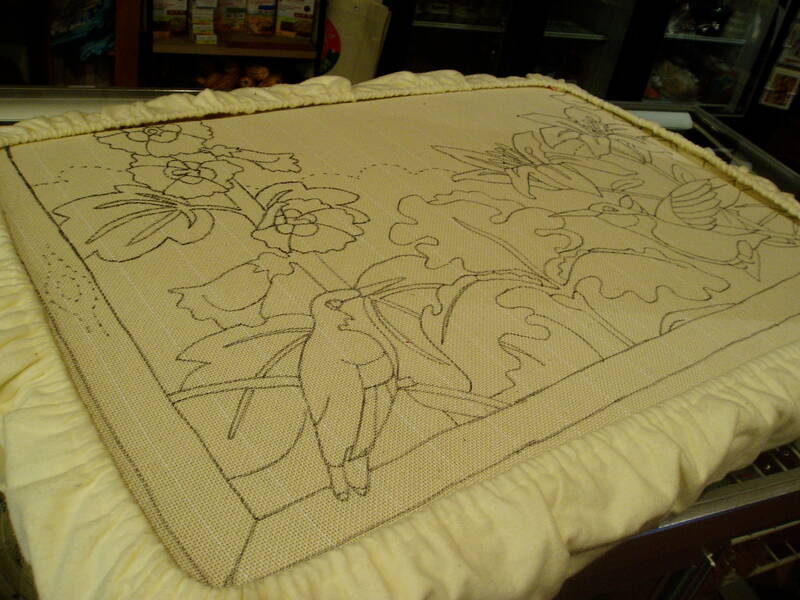 Punch needle rug hooking is worked on the back side of the piece, so the composition must be flipped. This is critical when there are words in a design! 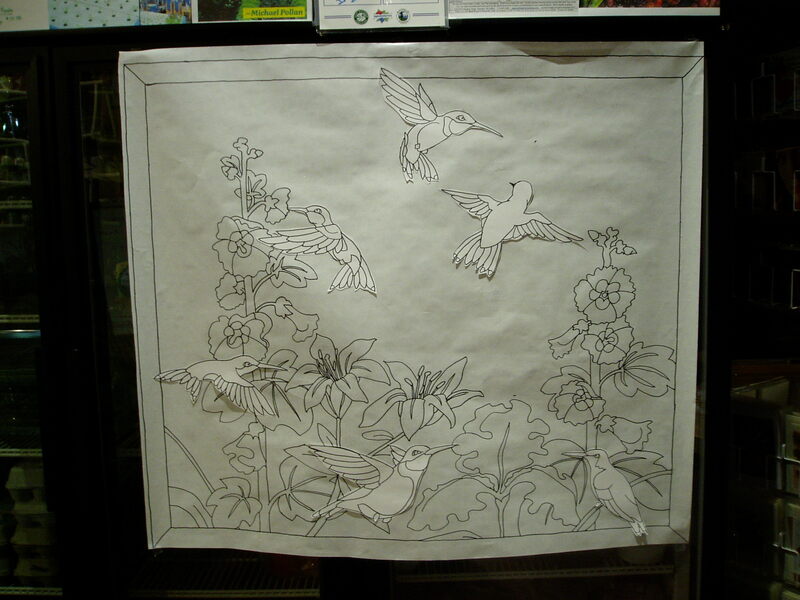 The hummingbirds could easily be punched in either direction, but it appears that most of the flow within the room (of the future home of this piece) is from left to right, which is the same natural flow of the composition. It felt better to have the viewer drawn in along their direction of travel, rather than be pushed back against it. Transferring takes care not only in accuracy but in working to make the design as close to “on the straight of the fabric” as possible. My light table was smaller than the design (this is my largest punch needle piece yet), so I had to periodically move it to re-draw more of the pattern, careful not to distort fabric from paper in the process. Rubbing the felt tip across the bumpy monk’s cloth is usually the demise of the Sharpie I’ve grabbed, but it’s well worth it for the ability to make distinct, permanent renderings of the design onto the “behind-the-scenes” stricture of the punch needle tapestry. After completion, the monk’s cloth will be entirely hidden from the viewer, but it’s critical role lives on. After transferring the design, it was time to stretch the backing onto a frame. The piece is much too large to work all at once (alas! ), since it would be impossible to create enough tension in the middle. Instead, I’ll be working the design in four quadrants, completing one section before moving the work. This presents unique challenge points, especially in regard to complex shading areas that overlap between the different quadrants. In “Trout and Swallows,” this came right across the head of one of the rainbow trout! I had to keep saving bits of yarn of the different colors to then use to finish the fish once it was moved on the frame. But that piece only required one move, and this will take three–so the challenge is on. Jumping right into that challenge, I chose the most difficult quadrant to stretch onto the frame first. This will include many color choices that will then replicate into the other parts of the composition. No putting off those decisions with this area. A flying male and a seated female area also within this frame, making a nice mix of birds, flowers, and background for punching. 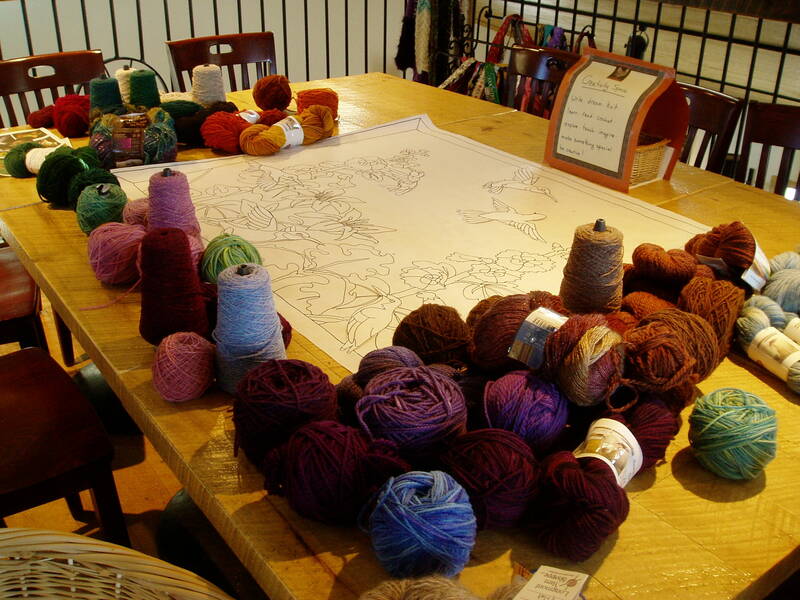 Now it’s time to break out the punch needles and begin the journey of transforming a line drawing into a color-rich textile. Check back for updates on the progress of “Hummingbird Haven.” What a joy to know that this piece already has a good home as its own haven at the end of the journey.